DALLAS — Poland’s Chief Rabbi Michael Schudrich knows how to take a punch. 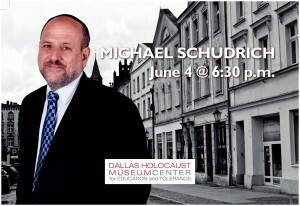 That’s why the Dallas Holocaust Museum/Center for Education and Tolerance wants others to hear his story. The gumption and bravery he showed taking a punch to the face from an anti-Semitic assailant in 2006 is the central reason he has been selected as the featured speaker for the 6:30 p.m. June 4 Upstander Series presentation. That incident happened right after Schudrich tried to speak with the man, who had just exclaimed “Poland for Poles!” as the rabbi was heading to Warsaw’s main synagogue with a group of people, wire reports state. But there are differing accounts of what happened next: In one, the chief rabbi squarely returned the punch. In another, Schudrich tried to punch him back — but was stopped from doing so with a face full of pepper spray from his attacker. But the controversy caused by the incident fell squarely in the chief rabbi’s wheelhouse, who moved to Warsaw in 1990 primarily to help organize and invigorate the fractured Jewish population. For centuries, Poland was home to the largest Jewish community on the globe, but as much as 90 percent of this population was murdered during the Holocaust. According to accounts, Warsaw was home to 393,000 Jews prior to the Nazi invasion of Poland, but only 5,000 remained in 1945. The very few who survived departed and never came back. Some stayed but they hid their Jewish roots — effectively preventing their descendants from learning about their heritage. The rabbi, a native New Yorker, set out to change that. In recent years, that amount has increased to 25,000 — an estimated 0.065 percent of the country’s population. This tiny figure is evidenced by the opening of the first JCC in the Polish capital, according to the American Jewish Joint Distribution Committee website. In a comment forwarded through Terri Arends, group fitness director at the JCC of Dallas, to the Texas Jewish Post, Schudrich emphasized the importance of increasing the Jewish population in Poland. “When Jews around the world discuss Poland, they have an obligation not only to remember the past, but also to recognize the work being done to bring as many Jews here in Poland back to the Jewish people,” Schudrich said. Max Glauben, a Holocaust survivor and member of the Dallas Holocaust museum board, said a nice Jewish community is developing in Poland, largely because of Chief Rabbi Schudrich’s efforts. But far too many people are still only now coming to terms with their true heritage. “The thing is, many of the Jewish youngsters were turned over to non-Jewish people to be raised and many of them are just now realizing they are Jewish,” he said. Glauben said he knows Schudrich and believes he’s doing good work.